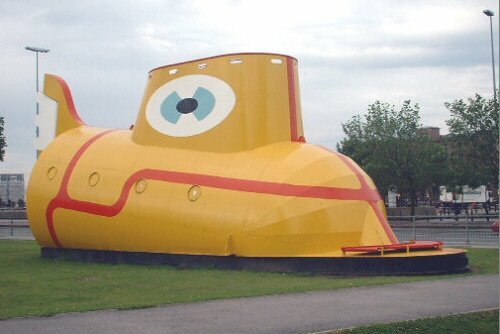 The Yellow Submarine on Chavasse Park. "In the town where I was born..." ....so began the immortal opening lines to the Beatles 1966 song: Yellow Submarine.The hit record and film inspired fans of all ages - including the apprentices at the world famous Cammell Laird Shipbuilding Yard, on the River Mersey. From a design by Graham Burgess, the apprentices built this 20 ton submarine, which is 51 feet long and made from plate metal, for the Liverpool International Garden Festival in 1984. It was transported across the Mersey to the Festival Garden site at Otterspool where it was one of the main attractions for millions of visitors. But, in 1997, the Festival site finally closed and the Yellow Sunmarine was left high and dry. 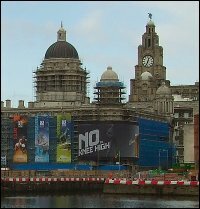 The tide turned when Liverpool City Council stepped in to rescue the Fab Four's rusting sub and gave it a new berth in the city centre. The Yellow Sunmarine was first taken to a council depot where it was repaired and renovated by New Deal trainees from the Liverpool Architecture and Design Trust. Fully ship-shape, it was re-launched at this site, Chavasse Park facing the Albert Dock, on 24th August 2000 for a new generation of Beatles fans. ELATED PageKits © ELATED.com 2002.